One of my earliest reviews here was for France's Libido Fuzz, and their debut effort "We're a Heavy Psychedelic Boogie Band", which is an excellent description of the group's sound. 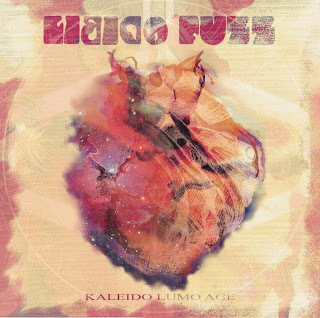 A couple years later and they've come storming back on Pink Tank Records with "Kaleido Lumo Age". The heavy 70's psych grooves roll on like endless sand dunes right from the beginning and come to a wailing conclusion with the track "Haight Ashbury"; which should evoke images of long haired hippie chicks passing around joints and flower power adorned VW vans from the title alone. And that's before the music even starts, but the super sounds of the 70's only get stronger once this thing gets rolling. A melodic vocal performance melds in with distorted and sometimes twangy riffs that aren't always front and center, but always demand your attention when they start howling. The shining gem among the tracks for me was number four, the southern rock tinged song called "The Postman", opening up with some thunderous drums, one of the heavier riffs on the album kicks in not very long after that. It launches into a swinging 70's rock track, with the vocals making their debut just a little bit after the guitars start. With this being one of the longer tracks at almost six minutes, the band uses up every moment doing what they do best, playing loud rock music with a heavy retro influence. And when you do it as well as these guys, putting your own spin on things, you can really start to breathe some new life into things that seem done to death. With all the groups fighting to find that older vibe that's getting so much attention right now, only a few are going to be able to do it right, and do it right consistently, I'd count Libido Fuzz among those few. The "early bird" pre-order for this far out psych trip just opened up last week, and the album is due July 14th, so you've got sometime to act, but wait to long and you might just miss out.